I went to see this kannada movie dubbed in hindi because of recommendations by my marathi relatives . This movie is doing better than Shah Rukh's 'Zero' inspite of having been released in fewer theatres . But on seeing it I found it to be a typical south Indian masala movie with over dramatic acting , loud dialogues , unbelievable action scenes . Walked out of the theatre about an hour after the movie began . Did not bother to watch full movie . Last edited by ashdoc; December 25th, 2018 at 09:28 AM. BTW, i watched 'Zero' on the weekend . Although it was rated badly, it had Hakla. Some other Desis dragged me to this one. To put in Perspective, the last Hakla movie i watched on screen was 'Swades' in 2004. And the last Hakla movie i watched on my own was DDLJ in 95. Coming back to this one, looks like the producer (Mrs Hakla) and director (dont know dont care), decided to implement 'Extreme Agile' in movie making. Here they wake up every fine day and decide what course the movie should follow that day. Hakla is supposed to be a 4'6" good for nothing guy (the height also seems extremely agile between the scenes). Pretty much playing his real self without heels. The story follows 'extreme agile' from there on. The zero goes from Meerut to Bollywood and then to NASA and ultimately to Mars and then back to earth. In between, besides the random story turns, there are usual Hakka antics and Anushka playing female Stephen Hawking. Moral of the story- you can be an illiterate loser and still make it big. Pretty much happens at many places in real life like Cyber Coolie cos.
Anyways- The movie is a big zero and you may not like it despite me not liking it. And KGF is one movie I am looking forward to. Saw some reviews... and a trailer. I am sold. Looks like Deewar all souped up to the highest level . Just waiting for a good print to show up... maybe a local theater is showing it. 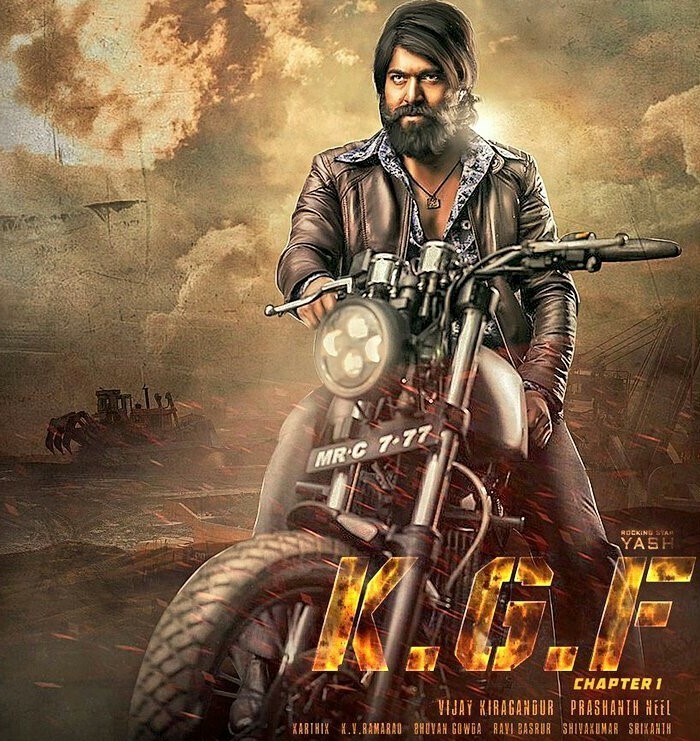 Saw KGF last night... with bated breath. And it did not disappoint. The story is typical... harassed and tortured people waiting for a hero. This sort of story abounds in all cultures and societies. And they do get a daredevil hero... now, will he save them or just fulfill his own mission... that is the question and the suspense. The story-telling, though confusing, is amazing. Only issue is, all characters have a beard... and they all look the same. And since this is a Kannada movie, I did not identify with any of the actors. So, over all... total mayhem. And the characters are presented in a staccato-style. By half-time you are thoroughly confused. But the director does take pity on the viewers... and slowly and steadily, the characters lay themselves out and the story emerges... only to finish as this is only the first chapter. even major fans of Rajini couldn't take the unbelievable BS action showed in the movie.. Fantastic movie. Boring in initial parts of 2nd half with too much focus on atrocities on poor people. Far better than any Khan movie of Bwood. Of course some people will not like it because it is from South They would rather watch a 5-foot khan smashing everyone with bare hands. saw this this weekend.. over the top yes - but definitely enjoyable... an audacious piece of film making..
it's on amazon prime.. and available in your choice of tamil/telugu/mallu -- so what the heck - give it a watch..